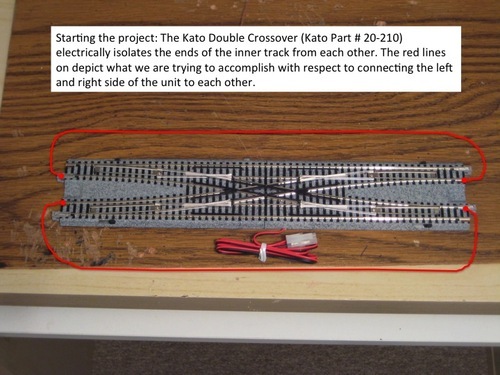 The issue of how to use a Kato Double Crossover on a single was an issue for me some time back. Since I had some time on my hands and had not hit my head on my work table for a while, I decided to open up one of these terribly expensive units and see if I could rewire the inside so that I could use the unit alone on a single. I have had a couple of these units in service for many years without any troubles. I happened to have another one of these on my workbench that needed the same treatment, so this time I decided to take photos. Thanks to Jeff Faust for starting up the How To Construct The Basic Module page and inspiring me to finally get this done. Jeff already explained the problem on his page, but I will repeat here. Basically, Kato isolates the front track from the back track on the crossover. This is a GOOD thing, so we can run each loop as a different block or on a different power supply; however, they also electrically isolate the left and right sides of the inside rail. 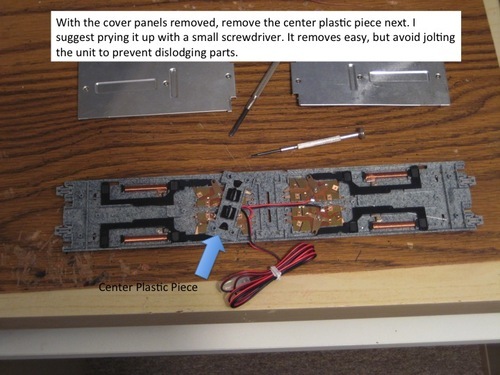 I don't know why they did this, but they did and it is a problem if you want to use the crossover on a single or avoid having to find some other solution to the problem. The picture below illustrates the concern. Here is what the inside of these things look like (before you bump it and all of the parts fall all over the floor). There are four switch machines packed in side of there along with some wires. 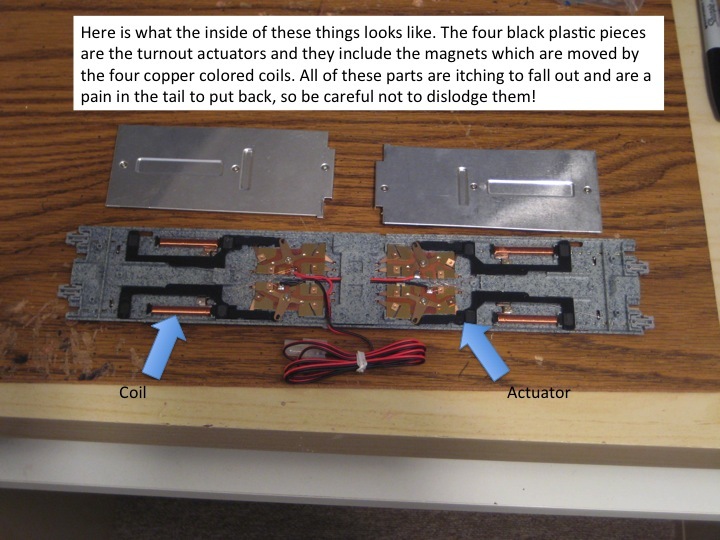 The copper-colored coils influence the magnets which are located in the black plastic actuating pieces and cause the turnout to throw. NOTE: Be very careful once you open this thing up. You can put all the pieces back, but it is a really big pain in the tail! Now that you have everything opened up and ready to go, the simple part is next. 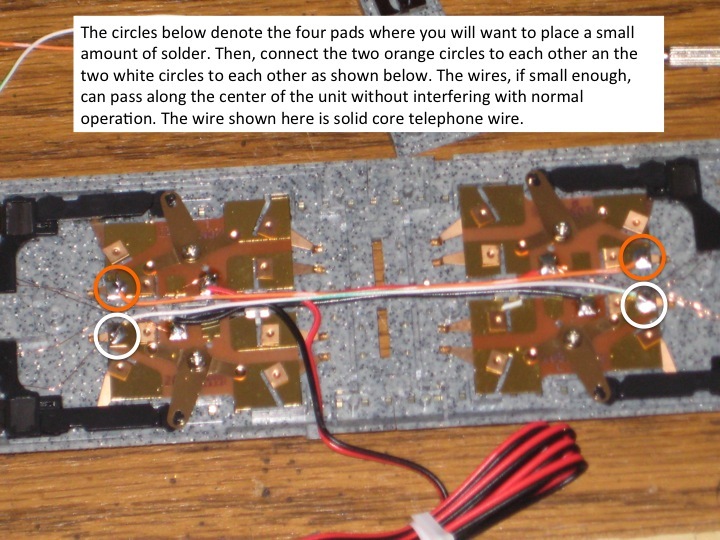 You will want to put a little solder on the pads in the four locations identified below. It only takes just a little bit. 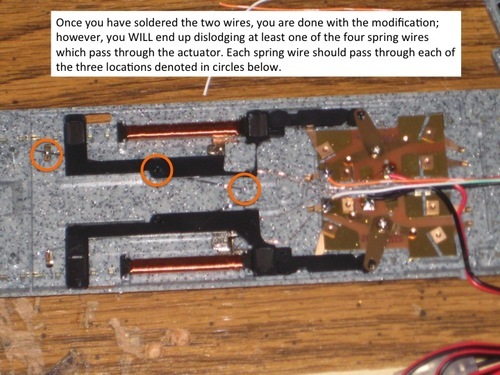 Next, you want to take two pieces of wire and connect the left and right pads to each other as shown below. You will want to put a little solder on the wire before you put it down just to help make sure it stays it goes on quickly to avoid burning up the pad. You will also want the wire to be just the right length. There really isn't any room in there for any extra wire to coil up. 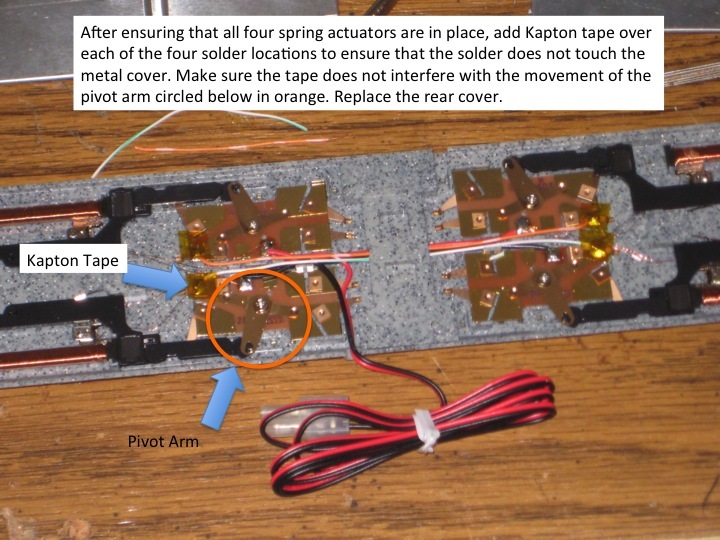 After you have the solder done and the wire in place, then you can replace the center plastic piece and also put Kapton tape over your solder. I do this since the cover is metal and I don't want to end up having a short caused by the additional height of the solder and wire. There are four little spring wires that attach to a pivot, which is under the little gray piece towards the center, pass through a hole in the black actuator and finally attach to a metal tab under the points. These things fall out of place when I breath on them, so the very last thing to do before reinstalling each half of the back cover is to make sure that these spring wires are properly in place. Congratulations, you are done. That's all it takes! Now, you can use your Double Crossover on a single with no further modification required.